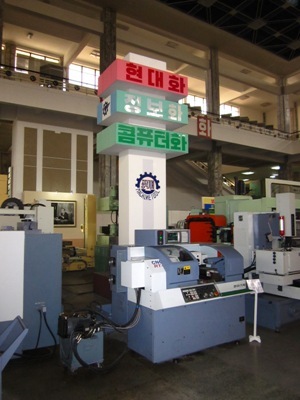 The company that is tasked with producing and selling CNC is Ryonha, through its subsidiary, Unsan. The company had a booth at the recent International Trade Fair in Rason, held in North Korea’s Special Economic Zone in the far Northeast, bordering Russia and China. Their booth was staffed by a Vice President and – as one might expect – attracted lots of attention from the locals in attendance. The president claimed annual exports of 30,000,000 euros to Europe, South America and South East Asia. He didn’t have exact details on profits, but mentioned that Unsan imported 10,000,000 euro worth of parts, mostly from Europe, such as control units and electronic relays Siemens and Arno. Their main CNC factory is 40,000 sq. meters and the “biggest in the world” according to the manager. They have two facilities, one in Pyongyang and one in Jagang with 12,000 employees in total. 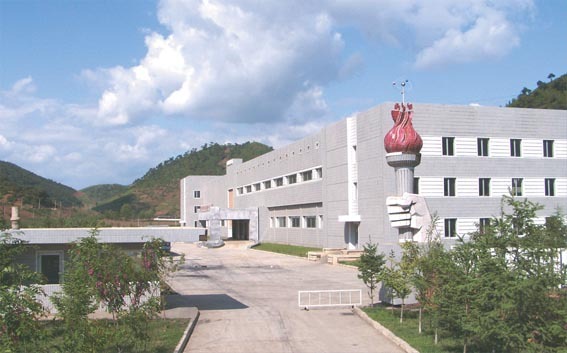 They want to open a factory in Rason, ideally without investors. Prices were said to be: 150,000 EUR for a European made CNC machine but only 52,000 EUR for an equivalent machine made in the DPRK, with the “same quality”. Unfortunately for Ryonha, it seems to be a subsidiary of the Korea Ryonbong General Corporation, which is under UN sanctions as a WMD proliferator. This no doubt impacts Ryonha’s ability to market itself to customers abroad. Ryonha also doesn’t seem to have a website, which can’t help, either. Should Ryonha’s parent corporation be taken off the UN’s list of designated proliferators, it will find easier access to a global CNC market that was $6.1 billion in 2007, before the financial crisis hit. The market has contracted since then, as the crisis left a global glut in inventory in 2009, which has taken well into 2011 to clear. The sharply reduced demand, particularly from automakers, has made the CNC market particularly competitive, though a sustained economic recovery would eventually drag the industry back up to pre-crisis levels. It’s difficult to know what kind of impact Ryonha might have on the global CNC industry, as customers and vendors alike are probably reluctant to trumpet where their machines are made. One of the effects of sanctions has been that companies try to hide their tracks when conducting business with the DPRK, even when the industry is unrelated to sanctioned items. This is sometimes done through an extra layer (or two) of outsourced contracts, or with textiles, sometimes just label-switching. This is tough to do with bigger machines, of course, leaving North Korean CNC machines facing perhaps understandable prejudices. Its impact on the domestic market will be more significant, of course, reducing the need to spend hard currency on imported CNC machines from China and elsewhere. Perhaps then, this import substitution will allow the DPRK to use that unspent capital on projects that actually benefit the daily lives of its citizens. 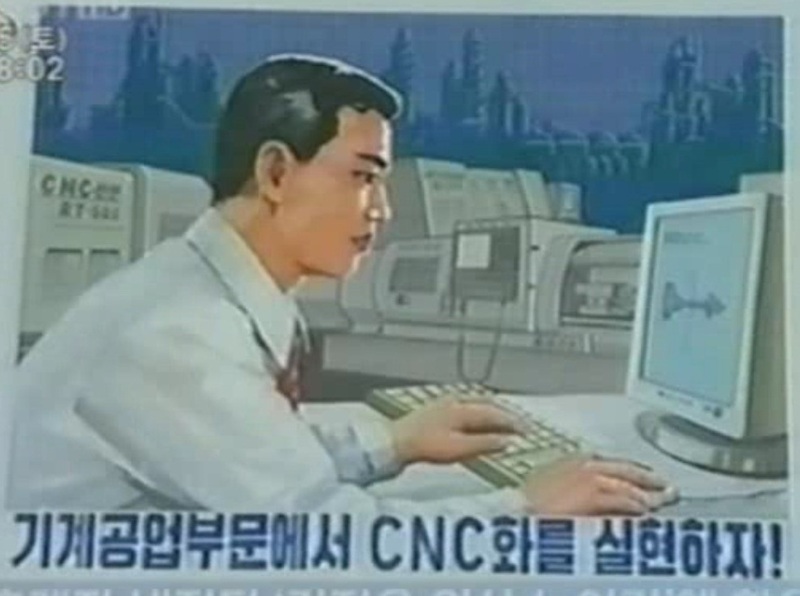 For those of you who have recently visited the DPRK or who spend too much time perusing Elufa.net or reading KCNA, you are undoubtedly aware of the DPRK’s recent emphasis on something called “CNC”. I had no idea what CNC was, so I began collecting as much information as I could find on the net and I have posted it below. 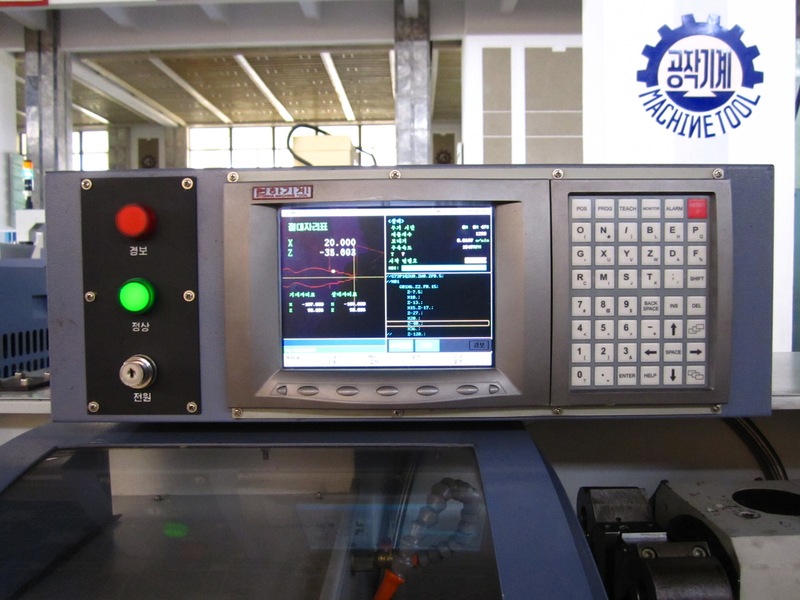 Numerical control (NC) refers to the automation of machine tools that are operated by abstractly programmed commands encoded on a storage medium, as opposed to manually controlled via handwheels or levers, or mechanically automated via cams alone. The first NC machines were built in the 1940s and ’50s, based on existing tools that were modified with motors that moved the controls to follow points fed into the system on paper tape. These early servomechanisms were rapidly augmented with analog and digital computers, creating the modern computed numerically controlled (CNC) machine tools that have revolutionized the design process. In modern CNC systems, end-to-end component design is highly automated using CAD/CAM programs. The programs produce a computer file that is interpreted to extract the commands needed to operate a particular machine via a post processor, and then loaded into the CNC machines for production. Since any particular component might require the use of a number of different tools—drills, saws, etc.—modern machines often combine multiple tools into a single “cell”. In other cases, a number of different machines are used with an external controller and human or robotic operators that move the component from machine to machine. In either case, the complex series of steps needed to produce any part is highly automated and produces a part that closely matches the original CAD design. That description is not nearly as helpful as this video on CNC: Click here (Might not work for readers in China). CNC – Juche industry’s power! CNC – an example of self-strength and reliance! So the narrative of building a “socialist paradise” is now being supplanted by the narrative of developing and producing state-of-the-art technology to, as the Pyongyang Times indelibly put it, “improve the people’s living standard on the word level”. This is how the DPRK is mobilizing its people to “open the gate to a thriving nation in 2012”. South Korea, watch out. By way of luck, I managed to obtain a copy of the DPRK’s CNC song. You can download the MP3 by right clicking here. UPDATE: A reader did find this DPRK karaoke version of the CNC song complete with lyrics (in Korean). Watch it here. UPDATE 2: A reader also sends in this acoustic version of the CNC song (YouTube). 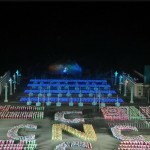 UPDATE: And CNC made part of the 2010 Mass Games (You Tube at the 1:25 mark). See a photo here. 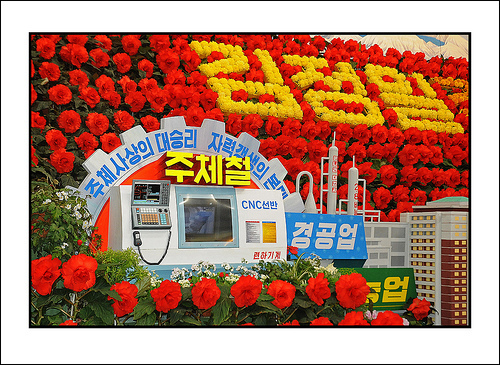 KCNA has published plenty of news stories about CNC. You can see them here courtesy of the Stalin Search Engine. 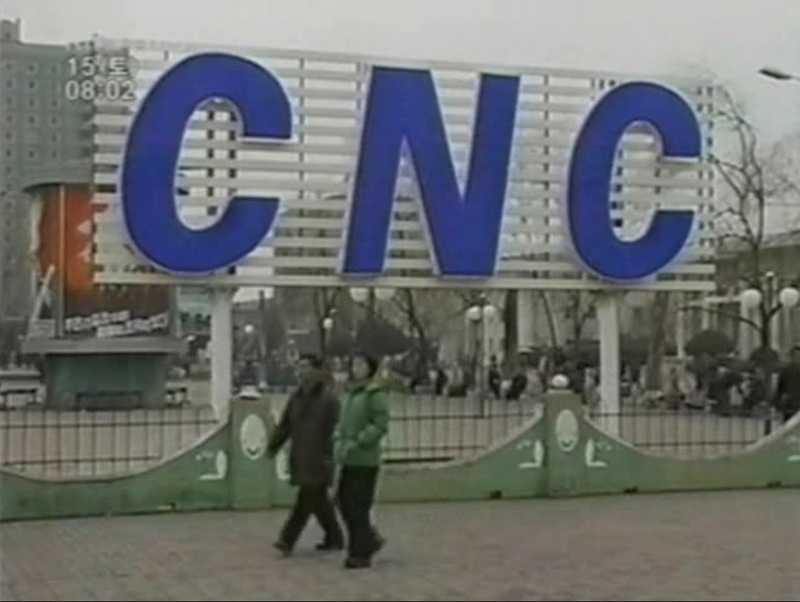 CNC was first first mentioned on January 15, 2002 (KCNA) . 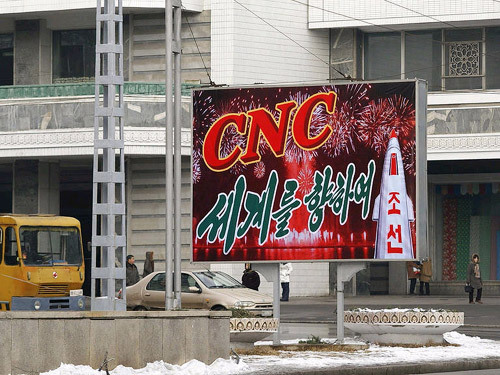 One phrase that is frequently mentioned is that thanks to innovations like CNC the DPRK is “Pushing back the frontiers of science”. Indeed North Korean economic policy seems hell-bent to do just that. Hopefully we will soon see them change their policies to “push back the frontiers of ignorance”. 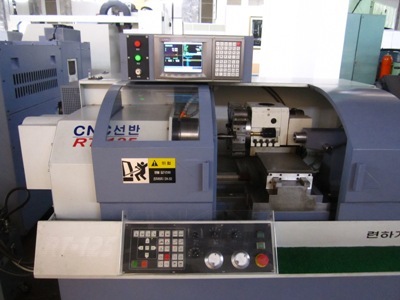 CNC machines are produced by the Ryonha Machine [Tool] Factory (KCNA) and they have been widely promoted in the official media (here, here, here, here, and here for example). It appears also that the Ryonha Machine Tool Factory has partnered up (with someone) to form a JV company which focuses on international trade, the Ryonha Machinery Joint Venture Corporation. Here is a PDF flyer of their products taken from the KFA web page, and some of the items they are selling can be seen here and here. The U.S. Department of the Treasury today designated eight North Korean entities pursuant to Executive Order 13382, an authority aimed at freezing the assets of proliferators of weapons of mass destruction (WMD) and their delivery vehicles. Today’s action prohibits all transactions between the designated entities and any U.S. person and freezes any assets the entities may have under U.S. jurisdiction. Today’s action builds on President Bush’s issuance of E.O. 13382 on June 29, 2005. The Order carried with it an annex that designated eight entities – operating in North Korea, Iran, and Syria – for their support of WMD proliferation. The President at that time also authorized the Secretaries of Treasury and State to designate additional entities and individuals proliferating WMD and the missiles that carry them. 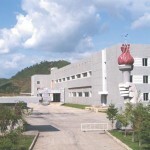 Korea Mining Development Corporation (KOMID), which was designated in the annex of E.O. 13382, is the parent company of two of the Pyongyang-based entities designated today, Hesong Trading Corporation and Tosong Technology Trading Corporation. These direct associations meet the criteria for designation because the entities are owned or controlled by, or act or purport to act for or on behalf of KOMID. Korea Ryonbong General Corporation, also named in the annex, is the parent company of the remaining six Pyongyang-based entities designated today. These entities include Korea Complex Equipment Import Corporation, Korea International Chemical Joint Venture Company, Korea Kwangsong Trading Corporation, Korea Pugang Trading Corporation, Korea Ryongwang Trading Corporation, and Korea Ryonha Machinery Joint Venture Corporation. As subsidiaries of KOMID and Korea Ryonbong General Corporation, many of these entities have engaged in proliferation-related transactions. 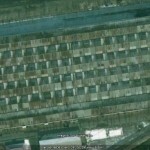 I have been unable to locate the Ryonha Machine Tool Factory on Google Earth. If anyone has any pointers, please let me know. I know the locations of many of these factories but not all. If anyone has any information on their coordinates, please let me know. Nearly two weeks ago, the UN Security Council sanctioned five North Korean organizations. One of them was the Hyoksin Trading Corporation. I believe they even have a web page here. The Obama administration on Thursday imposed financial sanctions on a North Korean firm accused of involvement in the country’s missile programs. The Treasury Department’s action covers Korea Hyoksin Trading Corp. It means any bank accounts or other financial assets found in the United States that belong to the company must be frozen. Americans also are prohibited from doing business with the firm. It is the latest move by the United States to keep pressure on Pyongyang, whose nuclear ambitions have ratcheted up global tensions. The department alleges that Korea Hyoksin Trading is owned or controlled by another North Korean firm, Korea Ryonbong General Corp., which the United States says is involved in the development of weapons of mass destruction. Korea Ryonbong supports Pyongyang’s sales of military-related items, the department said. I would be interested in more details about that KAMAZ truck assembly line in North Korea ! Where ?, joint venture ?, size ? Concerning the “Taebaeksan 96″ truck assembling plant, the KamAZ set it up last year (2007 or Juche 96) in the town of Pyeongseong. The terms of this deal with NK were really “friendly” and last year KamAZ was having no or very little profit. The production volume last year was very limited (45 or 48 trucks). However, it’s just the beginning of such cooperation. There is one technician-representative from KamAZ who manages the assembling process. He stays in Pot’onggang HTL and commutes to Pyeongseong. Many North Korean drivers and technicians seem to be technically ignorant (i.e. not knowing how to change the engine oil, etc. ), so they need a new technological culture to be introduced. Russians train them well and the North Koreans are grateful. Now that explains the brochure for the Taebaeksan 96 I’d noticed on the Korean Friendship Association’s exports page. I was wondering how anyone could be making money from sticking badges on KamAZes and trying to sell them on. In any case, the export potential for the Taebaeksan 96 must be close to zero, since anyone outside the DPRK who wants a KamAZ can buy one assembled by KamAZ itself. The link “brochure for the Taebaeksan 96″ given by Gag Halfrunt seems to indicate that the KamAZ Taebaeksan-96 is assembled in a joint venture with Ryongwang [Ryongbong] Trading Company of North Korea. Ryongwang Trading is also the joint venture partner of Pyeonghwa Motors (Unification Church) to assemble the “Whiparam” in Nampo. And Ryongwang Trading company is also business partner of “Kohas” company from Switzerland. And because of its connections to Ryongwang this Swiss company got in troubles with the US administration. A black Volkswagen Passat with smoked windows glides down a suburban Pyongyang road. Its license plate begins with 216 — a number signifying Kim Jong-il’s Feb. 16 birthday, and a sign the car is a gift from the Dear Leader. Even without a 216 license plate, a passenger sedan bestows VIP status in a country where traffic is sparse and imports are limited by external sanctions and domestic restrictions alike. He estimates there are only 20,000 to 25,000 passenger cars in the entire country, less than one per thousand people. North Korea moved early — shortly after the Korean War, and ahead of the South — to mass produce trucks and 4-wheel-drive Jeep-type military vehicles. Craftsmen took apart imported Soviet tractors, trucks and utility vehicles, measuring the parts to make copies. Lee Keum-ryung, a former used-car trader who defected from North to South Korea in 2004, agrees. The knockoffs came with “no air conditioning, no heater, and they’re not tightly built or sealed,” he says. “If you drive out of the city and return, your car will be full of dust. It’s like an oil-fueled cart.” Lee, 40, uses a pseudonym because he fears repercussions from North Korea. Material and energy shortages that accompanied a famine in the 1990s brought state-run factories to a halt. Recovery has been slow, and Schenau said he believes even domestic production of Jeep-style vehicles has been replaced by imports from Russia and China. Imports have similarly come to dominate what passes for the passenger-car market. Used cars — mostly Japanese-made — are the mode of transit for many members of the new trading and entrepreneurial class that has emerged in the last couple of decades. Under a loophole in the country’s long-standing private-car ban, these vehicles typically enter the country disguised as gifts to North Koreans from their relatives in Japan’s Korean community, Lankov says. A small passenger vehicle for which his agent paid $1,500 at the docks in Japan would sell for $2,500 to $3,000, Lee says. A bigger car — say, a Toyota Crown — might cost him $4,000 to $5,000; he would sell it for $8,000. While Japanese trade figures show annual exports of some 1,500 passenger cars, mostly used, to North Korea in 2005 and 2006, the total for this year is zero. After Kim’s government tested a nuclear device last October, Japan placed passenger cars on a list of banned luxury exports. Perhaps as a sign of displeasure with Japan’s sanctions, Kim ordered most Japanese cars confiscated, according to a February 2007 dispatch by South Korea’s Yonhap news agency. The order, if it indeed was issued, hadn’t been carried out by the time of a May visit to Pyongyang, when a number of Japanese cars could be seen. When a European-made import passes by, it’s often owned by the state, used by high officials and foreign dignitaries. Sweden’s Volvo had a hefty market share in the 1970s; Germany’s Audi and Volkswagen have made inroads lately. Mercedes is particularly well-represented in Kim’s personal fleet of hundreds of vehicles, according to Lee Young Kook, a defector who served in Kim’s bodyguard force. In a 2003 Yonhap story, Lee said the security-conscious leader traveled in motorcades of identical cars to confuse would-be assassins and generally maintained 10 units each of any model so five would always be road-ready. With the nation’s access to imports constricted, a relatively new player in the market, Pyonghwa Auto Works, has attempted to fill the gap. The company was created when Seoul-based Pyonghwa Motors, which began as a car importer affiliated with Rev. Sun Myung Moon’s Unification Church, teamed up as majority partner in the 70-30 venture with the North Korean state-owned trading firm Ryonbong Corp. The first assembly line was set up in 2002 at the west coast port city of Nampo to produce, from kits of parts, a version of the small Fiat Siena, called the Hwiparam (Whistle) in Korean. So far, the factory has built about 2,000 cars and pickup trucks, according to Noh Jae Wan, a spokesman in Seoul for Pyonghwa Motors, who said it is the only manufacturer now turning out passenger cars in North Korea. According to a February announcement by Brilliance China Automotive Holdings, Pyongyhwa has agreed to let Brilliance use part of the Nampo plant to assemble Haise minibuses. Kim Yong Sun, chairman of the Korean Asia-Pacific Peace Committee, met a delegation that had attended a ceremony of commissioning the Pyonghwa Motors General Factory at the People’s Palace of Culture today and had a talk with it in an atmosphere overflowing with compatriotic feelings. Company linked to Sun Myung Moon’s church is to open an assembly plant in April. At first glance, there couldn’t be a more improbable business proposition than opening an automobile factory in North Korea, where hardly anybody owns a car or knows how to drive. Even more surprising is that the company making this investment is an affiliate of the Unification Church, headed by the thumpingly anti-communist Rev. Sun Myung Moon. “This country was so closed that nobody, not God, not Buddha, could get in the last 50 years without a visa,” Park Sang Kwon, the president of Pyonghwa Motors, said at a news conference Friday in Seoul, the South Korean capital, where the company is headquartered. “Nobody, even in my own company, believed it was possible to build an automobile in North Korea. Only I believed.” Initially, the assembly line will turn out Fiat Sienas, a compact model, but Pyonghwa Motors hopes to develop its own model for the North Koreans. The unlikely relationship between the Unification Church and North Korea dates to 1991, when Moon visited the country’s founder and chief ideologue, Kim Il Sung. That paved the way for Moon, an archconservative who nonetheless supports dialogue with the North, to buy two hotels in Pyongyang, the North Korean capital, including the 161-room Potonggang, which boasts of being the only hotel in the isolated country with satellite television. The North Koreans also allowed Moon’s followers to develop Jongju, the northwestern town where Moon was born, into a pilgrimage site–another coup for the Unification Church because the communist nation bans all practice of religion. In addition to the car assembly plant, Pyonghwa wants to open a department store, gas stations, automobile showrooms and what the company described as a “World Peace Center” in Pyongyang to promote cultural and educational exchanges. Pyonghwa officials say they hope the investments will advance the reconciliation process between the two Koreas, estranged for more than half a century. Indeed, the name of the company means “peace” in Korean. “We will show the North Koreans brotherly love through this project,” Park, the company president, said Friday, flashing slides for journalists of North and South Korean employees working together in building the assembly plant, then clowning around as they pose for a photograph. “This is the first time anybody was allowed to put a company logo on a billboard in North Korea,” Park said. The plant’s grand opening, scheduled for April 5, comes as North Korea is going through a particularly rough patch in trying to attract foreign investment. The rapprochement with South Korea has ground to a halt, while President Bush’s characterization of North Korea as part of an “axis of evil” has hardly induced companies to invest. There also have been a number of well-publicized failures. Hyundai, the South Korean conglomerate, recently had to turn to its own government for a bailout to rescue its 3-year-old venture bringing tourists to North Korea’s scenic Mt. Kumgang. The company’s affiliation with the Unification Church is unclear. Several businesspeople in Seoul said it is part of the church, although company officials said it is merely owned by individuals who are church members, including Park, who owns about 80%. “This really has nothing to do with religion, and the fact that our president is a member of the church doesn’t affect the way the company does business,” said Lee Hyun Tak, a Pyonghwa official. The automotive arm of South Korea’s Unification Church said on Friday it has finished building a $55 million car assembly plant in famine-hit North Korea, whose government has pledged to buy 1,000 cars each year. “North Korea wants to develop its own model as soon as possible,” Park Sang-kwon, the company’s president, told a news conference in Seoul. Business prospects in the reclusive country seemed to glow shortly after President Kim Dae-jung of South Korea held an unprecedented summit in 2000 with North Korean leader Kim Jong-il. But relations between the neighbours chilled last year and have come under even greater pressure after President George W. Bush labelled North Korea part of an “axis of evil” in January. North and South Korea remain technically at war as the 1950-53 Korean War ended without a peace agreement. Undaunted by this atmosphere, Pyeongwha Motors Corp, the first South Korean company to build an auto plant in the north, says it sees a burgeoning market. Pyeongwha, which means “peace” in Korean, is a joint venture with North Korea’s Ryonbong company. The assembly plant in the port city of Nampo will be capable of rolling out up to 20,000 cars annually when it opens on April 5. Two years ago, Pyongyang completed a spanking new, 10-lane highway linking the port city of Nampo to the capital, he said. All that’s needed, Pyeongwha says, are cars to fill the empty roads of a country of 23 million people. However, there were just 3,000 passenger cars among the 290,000 to 300,000 vehicles in North Korea in 1999. The Unification Church, founded in 1954 by Reverend Sun Myung Moon and famed for mass wedding ceremonies, is also a considerable business force in South Korea. Its interests range from refining titanium to pharmaceutical products. Exports could begin anywhere from 10 to 15 years down the road, with North Koreans preferring to export an indigenous model fitted with a Pyeongwha engine, Park said. The orders from the North Korean government alone would be enough for the company to break even. Ssales are expected to rise to 2,000 to 3,000 cars next year, he said. The plant assembles one model for domestic sales, the Siena compact designed by Italy’s Fiat SpA FIA.MI. Pyeongwha has imported used Japanese cars into North Korea and refurbished for resale using North Korea’s cheap labour. It has been selling 20 to 30 cars a month, at between $10,000 to $15,000, mainly to foreign businessmen and diplomats, Park said. Park painted a picture of life in the North Korean capital far different from the horrific images of outer regions described by aid workers. “There’s a nine-hole golf course in the city, as well as a driving range,” built by ethnic Koreans in Japan, Park said. You are currently browsing the archives for the Ryonbong General Corporation category.